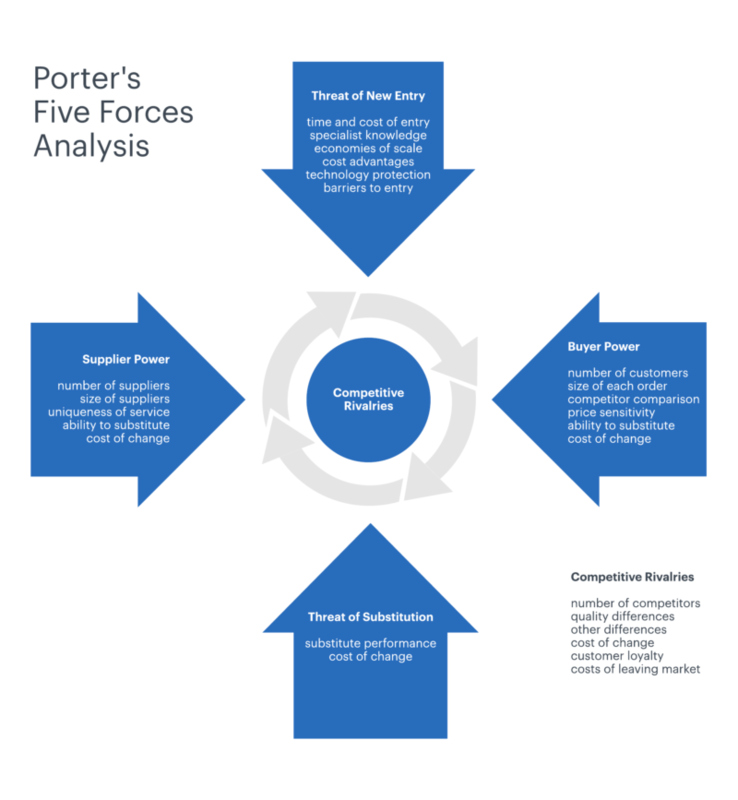 PORTER’S “FIVE FORCES” IS A POWERFUL FRAMEWORK THAT CAN GUIDE US IN UNDERSTANDING THE COMPETITIVE FORCES AT WORK IN HEALTHCARE, HOW THEY DRIVE THE WAY ECONOMIC VALUE IS DIVIDED AMONG INDUSTRY ACTORS, AND FINALLY, HOW WE CAN CREATE STRATEGIES THAT CHANGE THE GAME. Most of us in were taught that succeeding in business is about beating the competition. Depending on our particular definition of winning, this is certainly true on some level. But Porter’s Framework shows us it is a lot more complicated than a mano a mano struggle. But that created value may be minimized through the rivalry among existing competitors. It can also be bargained in favor of one industry actor or another. Consider the power of suppliers: Group Purchasing Organizations, for example, are intended to leverage buying power against manufacturers in favor of hospitals. Other forces include the threat of new entrants or the threat of substitutes for a service or product. Hardware manufacturers like Siemens, GE and Phillips may feel pressure from products developed in Japan or China. To diversify, Siemens recently launched Healthineers. GE created a comprehensive iOT platform with the launch of Predix. Strategies can be designed to create defenses against the forces of competition or to find a position where the forces are weaker, more to our advantage. Consider the strategy that has led Amazon to become a world superpower. Jeff Bezos understood fifteen years before anyone else, how to maximize the trend toward online buying. Starting with books, he evolved into selling “everything.” We should have intuited this given the name — Amazon. To accomplish his goal, Bezos created a network of semi-automated warehouses to offer one or two-day unrivaled package delivery to nearly every zip code in the US. He further strengthened Amazon’s position by creating service features for buyers that personalized an otherwise impersonal experience. And by understanding that every business, must become a technology business, Bezos founded AWS, jumping ahead of likely superpowers like Microsoft, Google, and IBM. The five forces framework also reveals that a fast-growing industry is not always a profitable one and how eliminating today’s competitors through mergers and acquisitions can actually reduce an industry’s potential for profits. For our industry, the framework offers insights on how government policies play a major role shifting the relative impact of the forces that drive the healthcare economy. In the final analysis, it’s not about who is the biggest. It’s about who is the most profitable. For surgeons and hospitals — with costs regulated by CPT codes and pricing standardization — the path toward profitability is efficiency. At ORLINK we believe AI can shift the forces in favor of hospitals seeking to increase margin while driving down cost. With the implementation of EHR’s and other computer-based systems, life is supposed to get easier for humans working in the industry. Unfortunately, with each technological advance, other kinds of stress often emerge — alert fatigue and information overload. AI has been referred to as a “suitcase” term; a word that incorporates many meanings. Every day we read about the amazing advances in AI, specifically in the fields of computer vision, deep learning, and natural language understanding. To use AI effectively we must first assign the right tasks to humans and computers. Surgical team members must perform the work they do best and AI should be designed to run tasks it can do better faster and more efficiently. In the OR, team members use observation, experience, and intuition to communicate with surgeons and fellow team members, take important notes about care, physically assist in procedures and interact with family members and other care professionals. Machines can search and analyze massive amounts of data in seconds, ensuring the right information is available when needed. Deep learning can also deliver actional insights to management. AI may take us to new levels of efficiency as human-computer systems by identifying best practices for procedures performed by human teams. Human teams can train computer vision models to improve recognition. And deep learning allows us to deliver dynamic suggestions and reminders at specific moments in the OR timelines for specific procedures. More data is not the answer. Right data is the answer. Most important, at ORLINK we are designing AI to relieve alert-fatigue and information overload. We can deliver exactly the right information in the moments that matter. Freeing humans to focus on what they do best. After all, there is another definition of winning that drives each of us in the world of healthcare: how much good we can do in our work and in our service to others.